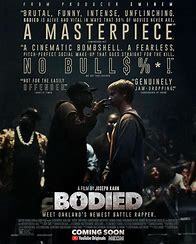 Bodied is a full length feature film produced by Eminem and directed by Joseph Khan. Think of 8 Mile’s concept, with the swag of You Got Served and the humour of The Hangover. I don’t know if that’s the best comparison but it gave off those vibes to me. Bodied follows a white wannabe battle rapper as he goes deeper into battle rapping. He wins a battle, befriends his opponent and together they create hilarity. Bodied had me from the trailer. I needed to watch it because it’s an Eminem project, but I wanted to watch it because it genuinely looked like a good film. Not to my surprise, it’s a pretty good film. I highly recommend it to people who are fans of the movies that I mentioned above. But please don’t watch this movie just because you’re expecting to catch a glimpse of Eminem. You’ll be waiting a while, probably till part 2 comes out, if that ever happens. The cast is great though and the film is well acted. There may even be a few familiar faces. The main character is played by Adam Merkin, the dumb kid from Austin & Ally. His supprting lead is played by Behn Grym, who is on BET’s “Real Husbands of Hollywood”. Then you have the professor being played by an 80’s classic, Anthony Michael Hall. How can you not want to watch this movie? The two hour long rated R film was released in late November of this year. You can watch it for free with your Youtube Premium membership. You can watch Bodied online below.